Hurricane Mathew changed the way many residents of central and eastern North Carolina think about flooding — including those in the Town of Windsor. The Cashie River flows through the middle of this Bertie County town on its way to the Roanoke River. Many days, the waters provide a great route for kayaking. But fall 2016 brought two powerful tropical systems. Tropical Storm Julia dumped flooding rains in September. 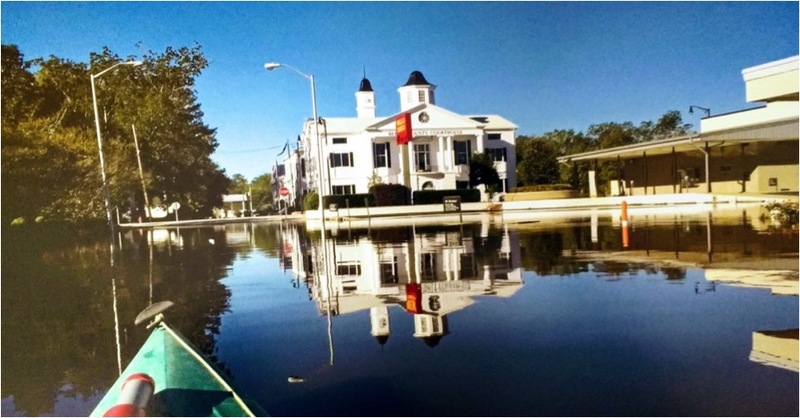 Just weeks later, Hurricane Matthew brought record flooding in October, causing extensive damage to roads, bridges, homes and Windsor’s business district. 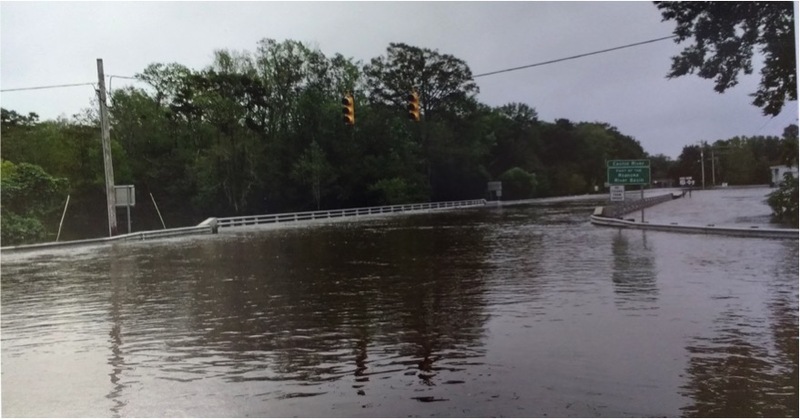 “Immediately following the flooding and devastation from Tropical Storm Julia and Hurricane Matthew, Windsor Mayor Jim Hoggard and Bertie County officials spent countless hours reaching out to regional resources for technical assistance in an effort to take a long-term look at the flooding in the Cashie River Basin,” shares Scott Sauer, Bertie County manager. 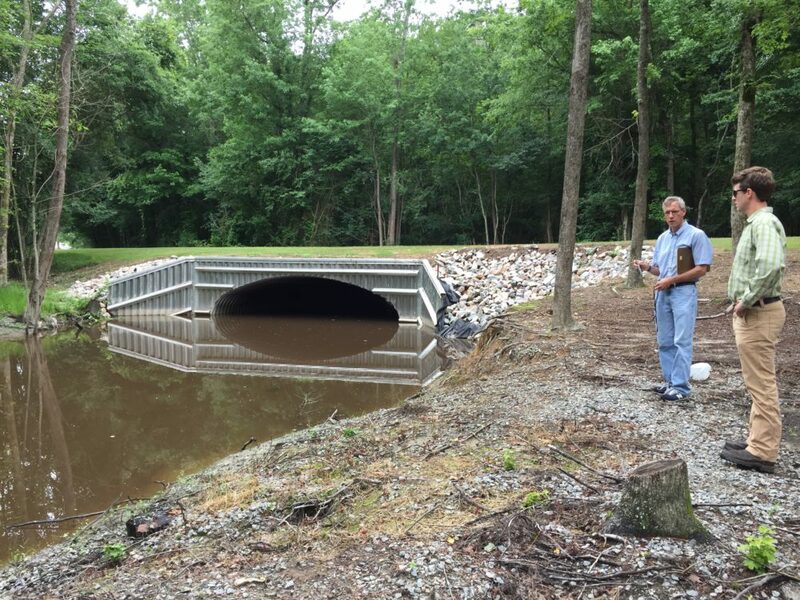 North Carolina Sea Grant and NC State University’s Biological & Agricultural Engineering Department have been working with local leaders to study the recent extreme flood events and evaluate flood mitigation methods. Bertie County secured a grant from the Golden Leaf Foundation to fund two studies of the Cashie River Basin and floodplain. The initial efforts can help the Town of Windsor and Bertie County move forward with a specific plan. Barbara Doll, Sea Grant’s water quality protection and restoration specialist, is leading the research. The team, which includes six engineers from NC State BAE, began the study in June 2017. The team is investigating structural and watershed flood-mitigation mechanisms. “We are looking at ways to reduce the amount of water that spills over from the river into the town during floods. We also are evaluating how much water is coming from the 180-square-mile watershed, and investigating ways to temporarily store and/or slow down the water,” Doll adds. To alleviate flooding, the team is determining the feasibility of three separate components. The first is evaluating river engineering alternatives. These structural measures could include modifying existing bridge and culvert configurations, or raising two roads and equipping the culvert pipes beneath the roads with backflow preventers or tide gates. The tide gates would allow water to drain away from town during small storms, and would block floodwaters from entering town during large flood events. By obtaining and reviewing existing flood models, as well as flood data from last fall’s extreme events, researchers can identify solutions that are most likely to have the greatest impact. “Initial results indicate there may be little benefit from increasing the capacity of bridges along the lower river,” Doll states. Increasing the capacity of the floodplain around Windsor also was evaluated but showed no appreciable decrease in flooding near the town. This is because of the nearly flat slope of the river’s water surface once it reaches the bridge — there is nowhere for all the water to go. Strong winds pushing the water from the Albemarle Sound and Roanoke River upstream also can exacerbate the problem and lead to flooding. Two other options, however, could be more promising. “Raising select roads at their low points and outfitting these areas with tide gates would help to reduce some flood risk. But that may not be effective in the larger floods like Julia and Matthew, and likely would not be certified under the National Flood Insurance Program,” she adds. Another component of the study is to evaluate land-use change, and to quantify the impacts on the Cashie River Basin and the Town of Windsor. Land use identifies the purpose of the land, such as forests, agriculture use or development. Models then allow the team to verify how the land cover has changed since 1992, and to quantify the impacts of those changes on hydrology and hydraulics — how much water and how fast it moves — in the river basin. The team also is focused on the third component: evaluating upland water storage potential. These storage areas — or reservoirs — are designed to decrease the magnitude of the flood flow. Slowing down the speed of the flow may ultimately decrease the flood risk in Windsor. the model is finished, we can test the ability of these areas to help reduce downstream flooding,” Doll explains. Opportunities to store water on agricultural lands have yet to be identified. The team scouted the watershed and found few agricultural ditches. “This has been an integrated technical approach using data already available through our state programs and agencies — and by leveraging skills and expertise of several research groups in the BAE department, Sea Grant and others within N.C. Cooperative Extension,” says Jon Page, extension associate engineer with BAE. “We have been able to apply our skill set in a very practical way to assist a community looking for solutions to the very relevant issue of extreme flooding and reducing flood risk,” he continues. Partners include N.C. Department of Transportation, N.C. Emergency Management and the N.C. Floodplain Mapping Program. The modeling work on the Cashie River and its watershed is expected to be complete by the end of the year, with results presented in January to the county and town. The feasibility study not only is yielding information for Windsor, but also will serve as a model for other coastal counties and towns. Doll and NC State researchers currently are working with N.C. DOT to develop similar watershed and floodplain-focused projects in the Tar, Neuse and Lumber river basins. Their new project will provide education and outreach on flood risk and mitigation alternatives, while also assisting communities recovering from Matthew — including Tarboro, Smithfield, Kinston and Lumberton — to identify potential effective means of flood mitigation. This article originally appeared in the Holiday 2017 issue of Coastwatch magazine.